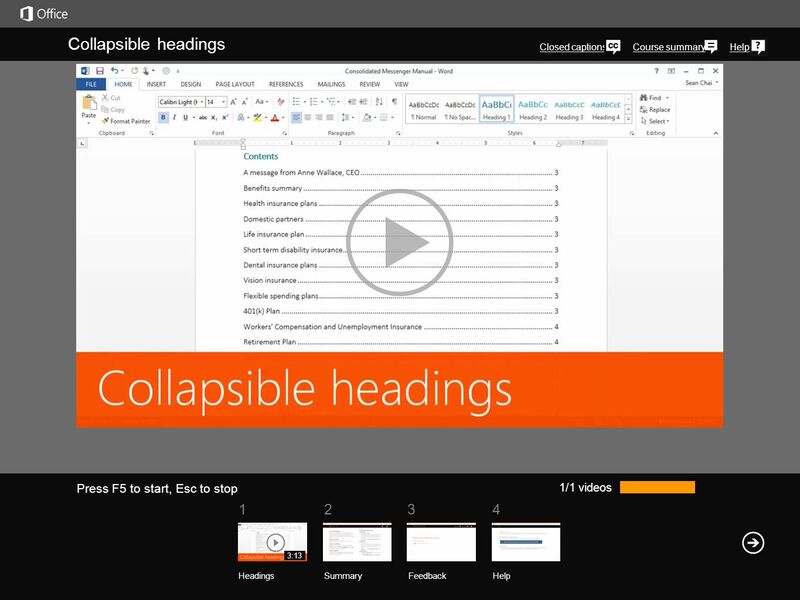 Collapsible headings j then press F5 or click Slide Show > From Beginning to start the course. In the message bar, click Enable Editing, If the videos. 2 1234 Course summaryHelp Collapsible headings Closed captions 1/1 videos Headings SummaryFeedback Help 3:13 Press F5 to start, Esc to stop Here’s a handy trick you can use if you’re having trouble navigating a large complex document.Right-click a heading, click Expand/Collapse, and click Collapse All Headings.Now with all the body text out of the way, it’s easier to browse through the document.The collapsed headings become something like a table of contents.To expand a section, click this triangle. And click it again to collapse the section.If you want to see all the text, click Expand All Headings.If you can’t collapse a heading, it’s either because you’re using an earlier version of Word – it only works in Word 2013 – or the headings aren’t formatted using one of the built-in heading styles.In this case, the writer added formatting to make it look like a heading,but as you can see in the Styles gallery, it’s still formatted as Normal.To change that, choose one of the heading styles. When you add a heading style, you add an outline level to the paragraph. And when you do that the triangle appears and you can collapse the heading.Collapsible headings are great for helping you read a document, but they can also be a time-saver when you’re writing. While you’re editing a document, you can select one or more collapsed headings to quickly copy,move or delete whole sections.Or you can click and drag a section to a new location.When you’re deciding how you want readers to navigate the document,you can lay it out with collapsible headings in mind.For example, if you’re designing the document to be read on a computer, you can collapse all the headings by default. Select all the headings you want to collapse.Then, on the Home tab, click the Paragraph dialog box launcher, and check Collapsed by default.Now when readers open the document, they can use the collapsed headings like a table of contents –choose the section they want to read and click the triangle to expand it.Here’s one last thing to keep in mind. Collapsed sections don’t print.So typically you’ll want to Expand all headings before you print a document.But you could, for example, use collapse and expand to selectively print only the sections you want.Click the File tab and Print. Print preview shows you exactly what will go to the printer.So collapsible headings can make it easier to read and quickly organize a document.But if you’re really serious about organizing a document, you should look into Outline view.For more information about that and other related topics, check out the links in the course summary. 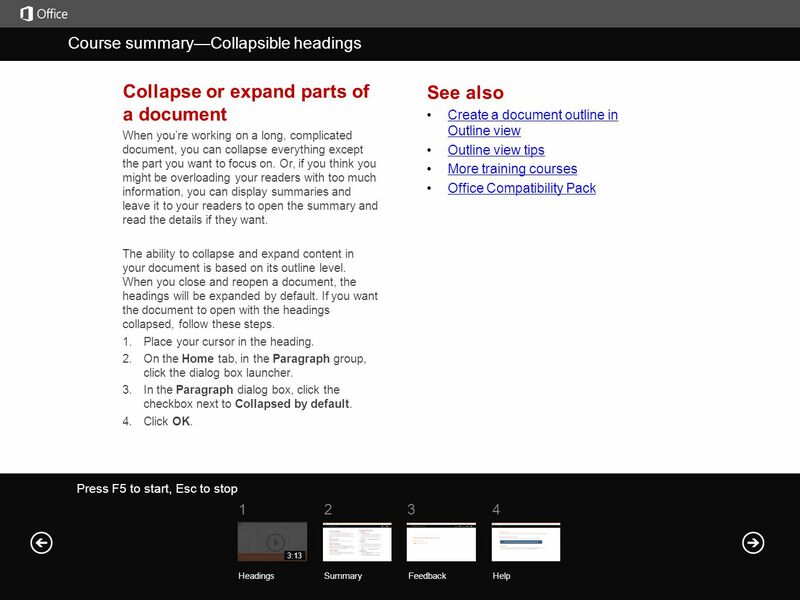 3 Help Course summary Press F5 to start, Esc to stop Course summary—Collapsible headings SummaryFeedback Help 1234 Headings 3:13 See also Create a document outline in Outline viewCreate a document outline in Outline view Outline view tips More training courses Office Compatibility Pack Collapse or expand parts of a document When you’re working on a long, complicated document, you can collapse everything except the part you want to focus on. Or, if you think you might be overloading your readers with too much information, you can display summaries and leave it to your readers to open the summary and read the details if they want. The ability to collapse and expand content in your document is based on its outline level. When you close and reopen a document, the headings will be expanded by default. If you want the document to open with the headings collapsed, follow these steps. 1. Place your cursor in the heading. 2. On the Home tab, in the Paragraph group, click the dialog box launcher. 3. In the Paragraph dialog box, click the checkbox next to Collapsed by default. 4. 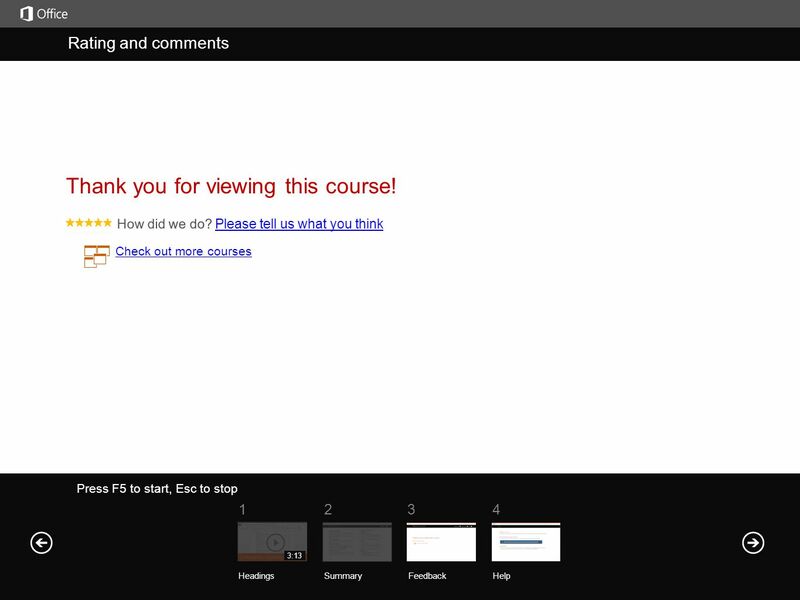 Click OK.
Download ppt "Collapsible headings j then press F5 or click Slide Show > From Beginning to start the course. In the message bar, click Enable Editing, If the videos." Add or subtract time j then press F5 or click Slide Show > From Beginning to start the course. In the message bar, click Enable Editing, If the videos. 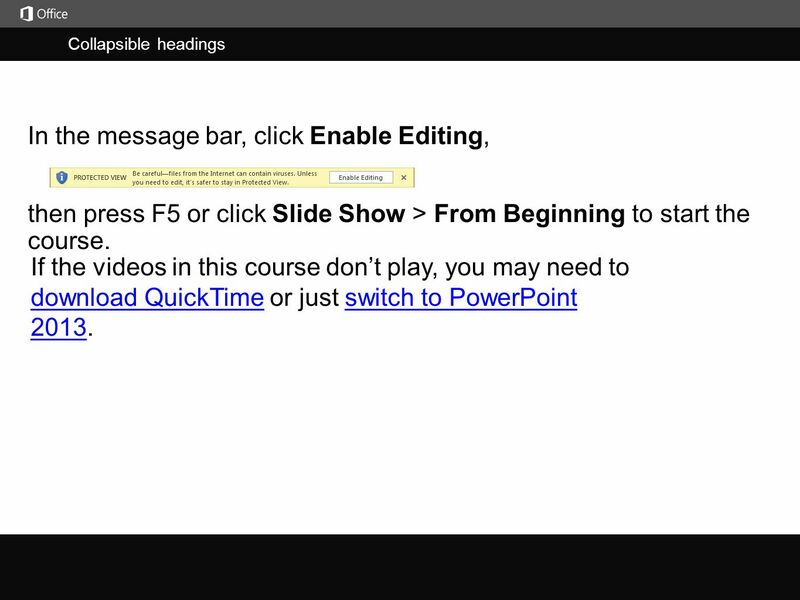 Rehearse timings for a slide show j then press F5 or click Slide Show > From Beginning to start the course. In the message bar, click Enable Editing, If. Congratulations! You have just installed the Presentation Game Add-In. Press F5 now to view this Quick Start Tutorial and see how easy it is to use the. Microsoft ® Office Access 2007 Training This presentation will introduce you to Microsoft Access In labs DB-2 and DB-3 you will practice some of. Crop a picture to fit a shape j then press F5 or click Slide Show > From Beginning to start the course. In the message bar, click Enable Editing, If the. Work with handout masters j then press F5 or click Slide Show > From Beginning to start the course. In the message bar, click Enable Editing, If the videos. Add sound effects to an animation j then press F5 or click Slide Show > From Beginning to start the course. In the message bar, click Enable Editing, If. Pasewark & Pasewark Microsoft Office XP: Introductory Course INTRODUCTORY MICROSOFT POWERPOINT Lesson 1 – PowerPoint Basics. 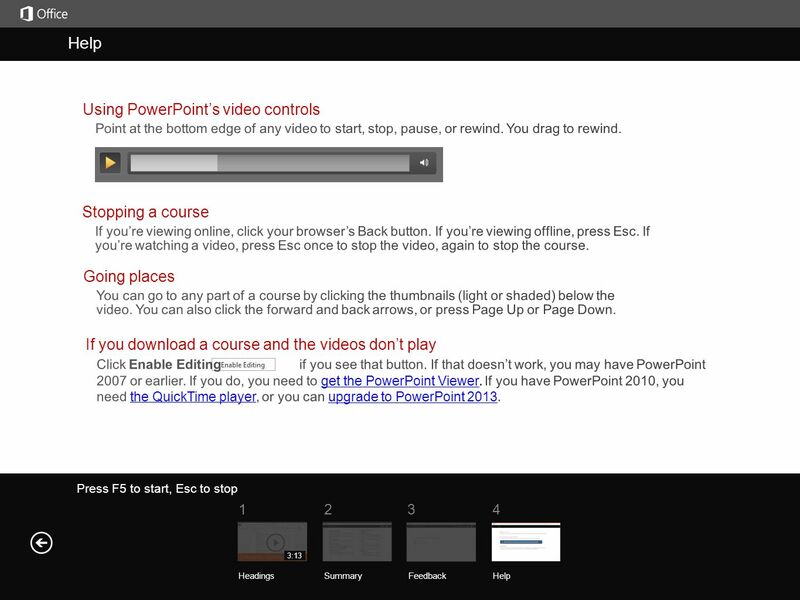 PowerPoint Basics Tutorial 2: A Slide Show In this tutorial you’re going to create a presentation from scratch. You will have to keep this presentation.